Great country style pattern by Royal China. 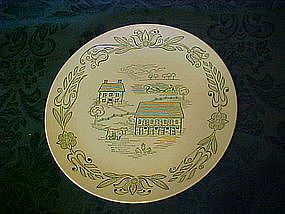 Called Wayne county, this pattern of various farm scenes are in green on a white background. Barn, the cow, farm house and the farmer tilling the field are all subject matter in this plates pattern. Dinner plate measues 9 1/2" in diameter and is in perfect condition with no damages. I actually have 8 available and price is per plate, and all are perfect.